Can A Family Kitchen Be Minimal? When my good friend Rayna (otherwise known as The Suburban Minimalist) kindly asked me to Guest Post on a ‘Minimal Kitchen’ it set me a little bit of a challenge. I am indeed an aspiring minimalist and Mum on the road to a ‘family life simply done’ but the one area of my home you couldn’t really describe as minimalistic is my kitchen. I have in excess of 35 spices, and a cupboard almost entirely dedicated to cake-making and decorating paraphernalia. It is the room in which I spend most of my time and energy, and organised it is (very) but minimal it is not. I’ve decided to open the floor up with a little bit of a ‘show and tell’ post. I’m suspecting that my kitchen couldn’t pass as minimal, but I hope you will agree it’s functional and organised with a little bit of fun thrown in. 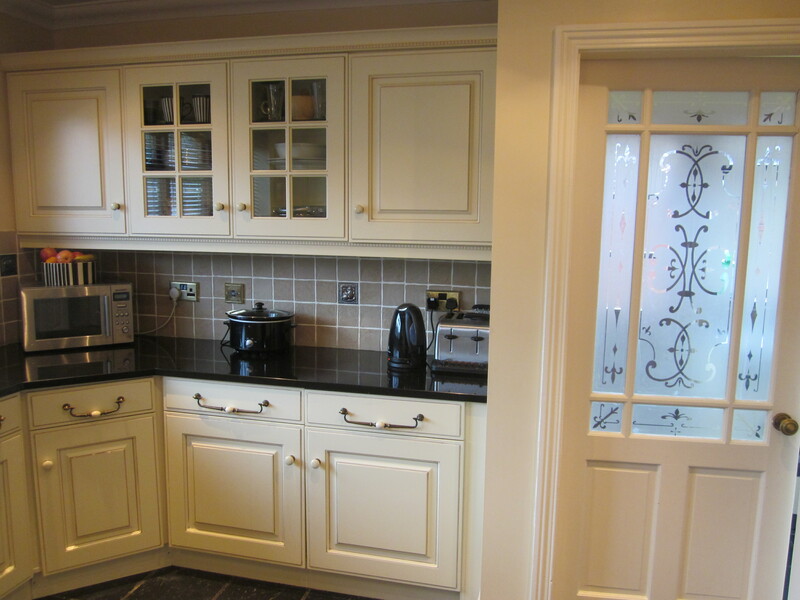 As you move round the kitchen you encounter the area that sees most of the action! This is the busy bit, where food preparation takes place. I try and keep the surfaces as clean and clear as possible. This surface holds a microwave (fruit bowl on top), Lil’ Bill my favourite slow cooker (the other two are tucked away in the cupboard), kettle and a toaster. Now the toaster I got with the Hubby (literally, it was a wedding present) – there was never a toaster in my childhood home and I’m still not convinced. But the Hubby isn’t backing down. This is also the area where my fridge and freezer resides. This isn’t a great snap – it’s dark in the UK today and the window behind doesn’t help, so please bear with me! This is a bitter sweet area for me. It contains the sink. I hate washing up – I’m a cook not a cleaner (my Big Sis got those genes when distributed). It also contains a dishwasher – Thank goodness. I’ll deal with the TV first. Now this isn’t going to be everybody’s cup of tea! I watch and listen to all sorts of programmes. An awful lot of food shows of course. It makes me feel like I’m actually in the real world when at 10pm on a Friday night I’m decorating a birthday cake. Above the TV is the Menu Board, and there’s also a stereo and far too many CD’s (can you see the boxes above cupboards? Oh dear!). The reduction of the CD’s is a work in progress. I love music and am slowly transferring years of collecting CD’s over to the iPod. 1. ‘Peely Bin’ to reduce trips to the recycling bin outside in the winter – just one trip a day. 4. Piggy bank – ‘see a penny pick it up’ – I got my inspiration for this from Coingirl way back in 2009… I pop any finds in this little piggy! 5. Electronic Weather Station – a new take on a barometer. It was a birthday present for the Hubby off my Mom many years ago and probably the only gift he has ever received that he hasn’t taken back (don’t ask). This is where the non-slow-cooking takes place. Above my Range Oven the mantelpiece holds some more of the kids creations. When we visited friends in Cornwall this year they decorated ‘horses’ overlooking Falmouth Harbour. Happy memories… Finally to the left next to the door is my ceramic notepad – which I love! The shelf next to it holds my mobile phone and ‘day book’. Minimal? Nah not a chance! Simple? Hmmm depends how you define it…. I love my kitchen and it works for my family. How does yours work for you and going back to the original question can a family kitchen be minimal? ps – I’m going to try and upload a 360 degrees video onto my facebook page for a virtual tour – if I can work it out! pps – don’t forget to pay Rayna a visit and check out my top ten kitchen items for those who want to get down to the basics! Thanks Carla – it’s always good to see something through fresh eyes. Actually when I looked at the photos, it doesn’t look cluttered as such, but it certainly isn’t minimalist design! I do have quite a few cupboards, of which 4 are handed over to my daughter, she keeps all her art supplies in them. But this amount of storage does mean I can keep everything tucked away. I also have a minimalistic husband who I have to keep my eye on. From time to time I find him emptying the cupboards that hold pots and pans and other equipment and rearranging them (although he uses NOTHING out of them, so unsure as to why he thinks its in his jurisdiction to do this). He then interrogates me as to what can be thrown away. It’s a pain and a pleasure at the same time. I get very neat tidy cupboards, but do get fed up explaining what I use it all for! I love your kitchen. You have managed to keep the work surfaces uncluttered and useable. Well done you. Thanks Suze! 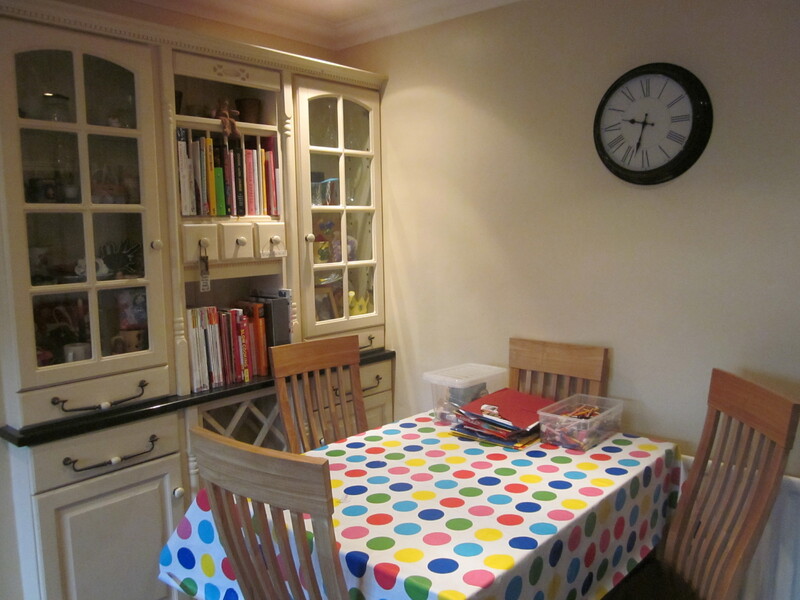 I have to keep them clear as actually there isn’t a huge amount of space considering my kitchens quite large (well adequate in that I can get a table in etc…). I lose all of one side where the oven is due to the layout. Because I do a lot of cooking this space could easily be used up once I got going. Also I’m not a big appliance fan, most things can be done by hand! Similar to our kitchen, I think us Mums spend so much time in there we’re allowed some entertainments! We gave away our microwave this year, I did an experiment to see how much we used it, and managed without for a whole year! We keep all fruit in the fridge so no fruit bowl. I’ve thought about whether I’d manage without a microwave, and I probably could but it does help. I don’t microwave in plastic and always use glass or ceramic. It gets used for very specific things such as heating milk which I hate doing on the hob. Most things if reheated are done in the oven or on the hob. The only time I’ve gone without recently was in France over the summer, and although I managed, I have to admit I did miss it a teeny weeny bit!! As a pretty organised lady yourself I’ll bet you rustle up some stunning dishes in the space you do have! I loved taking a tour of your kitchen Jo! It’s amazing. I love your cabinetry, countertops and flooring. Gorgeous! It was so fun to get a glimpse into your world! Okay had to Google that – the only Pandora we have over here is in the form of bracelets mainly! Interesting! I’ll look at it further – apparently only you Guys over there have it. I agree with the others – your kitchen is beautiful! I’ve been asking myself the same question, and I have to say, that I have pared back a lot, so I really use the things that I have. So, while my kitchen isn’t truly minimal, it is functional. I’ve made an effort to clear off counters, like yours. I do have a bit more paring back to do, I think, particularly with the holidays around the corner (everyone knows I like to cook so they often get me kitchen gadgets and gizmos that I don’t need), but it’s a work in progress. Thanks for sharing pictures of your space! I love getting a glimpse into other people’s real homes! How beautiful, Jo!!! Thank you for the tour – eye candy, indeed! You’re welcome. The pleasure is mine! If inclined, I would love, love, love to see more of your home. It looks so beautiful. I found myself nose to computer screen peering into your – foyer? – via the door to the left of the stove. I’m like that nosy guest (“Do we get a tour?’), but I plead “not guilty” since you seem to have the interior decorating gene! Hun – It’s called a ‘hall’ in the UK 🙂 My Hall contains – nothing! Not one piece of furniture not even a rug. It does however a rather ‘fetching’ chandelier (note tone of sarcasm!) – I despise this light fitting. We inherited it with the house. Peer a little closer 😉 and you’ll notice it hanging just above our wedding photo. It’s on our ‘todo list’ to change – I have found a suitable light fitting elsewhere, but we just haven’t got round to it – and it’s been three and a half years! Boy do we think about purchases or what? I’d like a narrow side table in there by the door – but am concerned that a ‘surface’ will just attract clutter – so jury out at the mo. The coats and shoes etc are hidden away under the stairs. 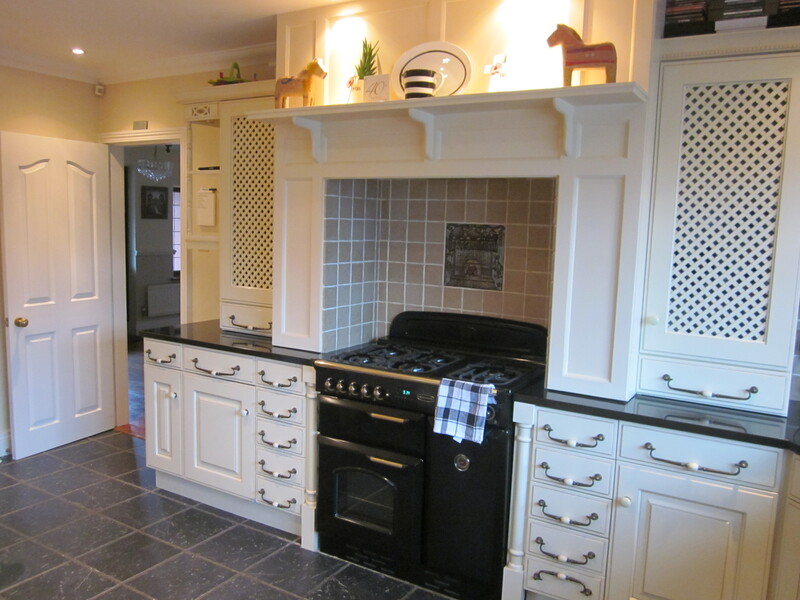 *Drools over the range cooker* Thank you Jo, i just loved the virtual tour! I think that you and I are polar opposites, i spend the least amount of time i can in my kitchen (if you have seen my house pics on 365 less things you will understand why-it’s tiny) But i’m with you all the way with the entairtainment, i listen to Radio 2 aswell, just love Jeremy vine in the afternoon and Chris in the morning. Yes a family kitchen can be minimal, mine is, but i think part of living simply is having enough to suit you and your family. One family’s idea of minimal is different to the next, as long as your comfortable with how it is. Your kitchen has a real ‘country kitchen’ feel to it, i can almost imagige a barn door with ducks and chickens roaming round the yard, it’s beautiful!! P.s I am to expect a parcel on Saturday, so i’ll let you know! No barn door with chickens I’m afraid. Now that’d be lovely! I do live in a village but it’s rather suburban and is classed as ‘semi-rural’ – so a mix of fields and houses! Hi Jo H – we bought the house with the kitchen in it. I moved over three years ago now – we moved from an ‘old’ house with a minimal modern kitchen to a ‘modern’ house with rather an oldy worldy kitchen installed. This post has really helped, as I have moaned quite a bit about my kitchen since moving in – so it was nice to see it through fresh eyes. The cupboard doors and handles are rather detailed – so cleaning is a bit labourious, the granite worktops are very cold, so rolling icing and pastry (as well as kneading bread) has to be done on top of a large plastic mat I have for baking. -they also show up water marks, smears etc… there’s a few other things also! But after photographing it and hearing the comments I realised there are pro’s and con’s to it – but actually it feels very homely when I’m in it – and although not minimal it’s very functional. 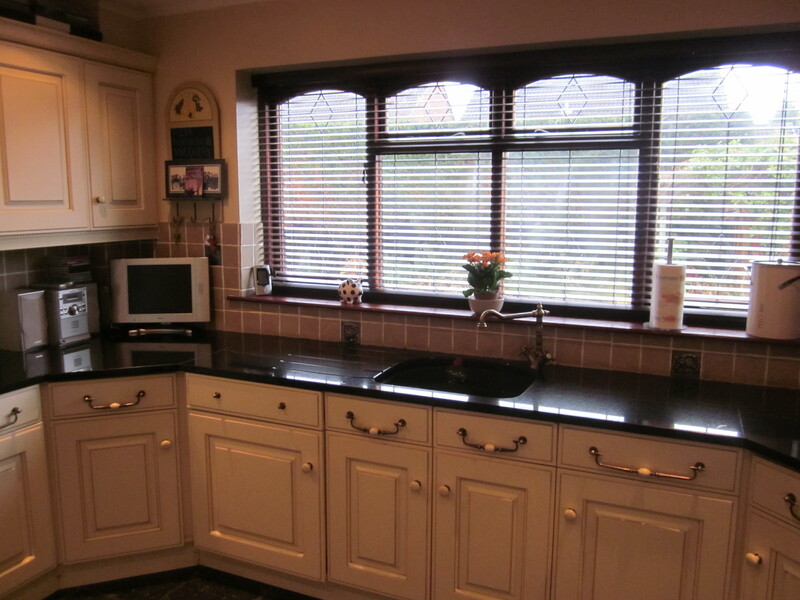 p.s – when we viewed the house I liked the size of the kitchen so it did influence my decision. I’d had a Galley kitchen before. No room for a table, and this was key for me when we moved, as was a separate playroom to lounge area. Pros and cons – yes – in my home too. It is big with several baths – convenient, but makes for more housework. The kitchen has a light-coloured floor and cabinets, which makes it nice and bright, but it’s harder to keep clean-looking. And so on! Your kitchen is gorgeous! Just stunning! I love the row of windows over the kitchen sink, the beautiful cabinets and everything is so clean and organized! Thank you so much for sharing your kitchen with us.